The next big grade separation project on the peninsula rail corridor will be at 25th Ave in San Mateo, a logical next step in the decades-long process to grade separate the corridor. This grade separation will establish a 6.5-mile stretch of 100% grade separated right of way, laying the groundwork for a future four-track mid-line overtake facility that will allow express trains to overtake slower commuter trains under the "blended system" jointly planned by Caltrain and the HSR authority. The latest plans presented to the Caltrain board of directors show a split-grade elevated solution, built sufficiently wide for four tracks but initially only fitted with two tracks spaced on approximately 48-foot centers. 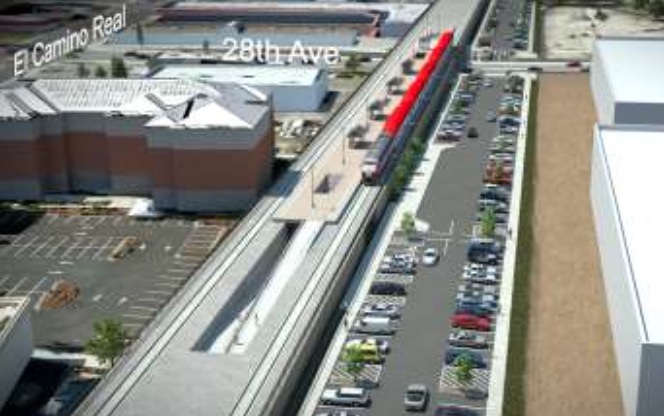 The Hillsdale station is moved north by a quarter mile to straddle 28th Ave, and fitted with a central island platform sized approximately 36 x 700 feet and built 8 inches above the rails. Of course, the accelerated schedule for its completion is closely linked to electrification, so quite soon thereafter it might look like this, with mixed diesel and EMU service. Note that per Caltrain plans, the overhead contact system is 22 feet above the rails. plenty to clear even the tallest freight cars. While it's a fine idea to build the new grade separation sufficiently wide for four tracks, demolishing the "New Hillsdale" station only to replace it so soon with a "New New Hillsdale" seems terribly wasteful. Perhaps this is another case of "why build it right when you can build it twice?" Surely there is a better way. The overhead contact system is built in its final configuration 22 feet above the eventual height of the tracks; because the tracks are raised by 43 inches, the vertical clearance is temporarily reduced to 18' 5" which still safely accommodates Plate F freight cars, the tallest that have historically been used in this part of the corridor. Therefore, there is no constraint to freight service. This electrification will never change, with all the portals in their final configuration. Built once, and built right! Placing the express overtake tracks on the outside, in a fast-slow-slow-fast or FSSF configuration, as opposed to the traditional slow-fast-fast-slow or SFFS configuration inspired by road design, is a key architectural decision for the blended system. The forces of traditionalism will argue strongly for SFFS because that's how it's "always" done, yielding nice straight express tracks down the middle of the corridor-- but clear exceptions to this "rule" exist, with examples of FSSF corridors in these videos from Sweden (with 125 mph express trains!) and Australia. The fatal operational flaw of traditional SFFS corridors is that when a track must be taken out of service, either accidentally or intentionally for maintenance, commuter trains either must cut across the express tracks (fouling express traffic) to reach the opposite platform, or use super awkward bridge plates to board from the fouled express track. In contrast, an FSSF island platform is operationally flexible: the train simply crosses over to the opposite side of the island, without ever getting in the way of express traffic. For the peninsula "blended system" where Caltrain and HSR share the corridor, the operational headaches of SFFS could prove unworkable in the long run as the rail corridor is maintained. One argument systematically trotted out against FSSF is this: wowing express trains around the outside of every island platform will make for a slalom "barf ride" that will give HSR passengers motion sickness, if not downright whiplash. This argument intuitively rings true, but turns out to be patently false when you run the numbers. In reality, an express train blasting around the Hillsdale island platform at 125 mph will do so on curves with a radius greater than four miles, requiring just 2 inches of superelevation to be rendered imperceptible to passengers. Another argument leveled against FSSF is that the island platform arrangement requires additional right of way compared to a traditional SFFS outside platform arrangement. The footprint of a FSSF station can be made nearly as compact as a SFFS station, especially if the central island platform (shown in the above diagrams at 33 feet wide) is slightly tapered at its ends, yielding an imperceptibly curved platform that is for all practical engineering purposes the same thing as a tangent (straight) platform. In any case, the available right of way at the Hillsdale location is a generous 150 feet wide, making such footprint considerations moot. DON'T rebuilt infrastructure multiple times. DON'T build station platforms that are not compatible with level boarding, where this can be avoided. DO create the Caltrain engineering standards for level boarding. 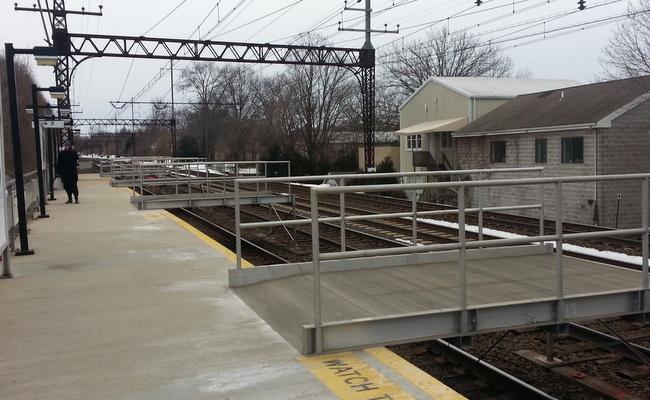 DO build the new Hillsdale station with a level boarding platform, years before the transition to level boarding occurs, by temporarily raising the track bed to make the platform only 8" tall. DO put the high speed tracks on the outside, in the FSSF configuration, for operational flexibility. CBOSS, the Communications Based Overlay Signal System, is a Positive Train Control (PTC) system being developed by Caltrain to prevent human error from killing or maiming passengers or rail workers. It is a deeply troubled project. Caltrain recently requested a peer review of the project from APTA, the American Public Transportation Association, whose subject matter experts were given access to personnel and documents. Download the final report from the peer review here (500 kB PDF). The list of documents reviewed by the panel in Appendix C would make a juicy FOIA request. The already egregious sum of $231 million to cover a measly 51 route-miles with PTC is about to increase significantly, something you would never guess from the latest CBOSS update provided to Caltrain's laissez-faire board of directors. Fast forwarding to whatever year it eventually takes place, the RSD (Revenue Service Demonstration) will consist of flipping the "on" switch and transforming rush hour into an epic cascade of software glitches reminiscent of the 1998 MUNI Meltdown. On that day, we will all know that this CBOSS turkey has finally come home to roost, as was foretold way back in 2009. These days, Caltrain is breaking a ridership record nearly every month. Rush hour trains are running with standing-room-only crush loads, measured by Caltrain's statistics as a percentage of seating capacity. The most recent ridership counts (tallied during the low-ridership season in the first quarter of 2016) showed several trains running at 125% of seated capacity, even after the addition of a sixth car. Capacity, or the lack of it, is becoming a problem and Caltrain will need to do more about it before 2020. The recent award of electrification contracts, including an order for sixteen new six-car EMU trains from rail vehicle manufacturer Stadler, has brought this issue to the forefront. Caltrain's Chief Operating Officer for Rail, Michelle Bouchard, had to concede in front of the Caltrain board of directors that the new EMUs would initially have a lower seat count than the diesel trains they will replace. The argument was that increased capacity could be achieved by increasing train frequency from 5 to 6 trains per peak hour per direction, and ultimately by lengthening the EMUs from 6 cars to 8 cars, something that can be done to an EMU without loss of performance or track capacity, unlike a diesel train. Here are some thoughts about the capacity problem. Capacity is measured in people, not seats. Measuring passenger load factors as a percentage of seated capacity works well for airplanes, but doesn't quite do the trick for a transportation mode where passengers routinely stand. The design of a train, including the number of seats, the interior layout, and accommodations for standees (handrails, poles, straps, etc.) has an enormous effect on the level of comfort experienced by passengers when the car operates at "125% seated capacity." In rail vehicle A, filled with seats and with few places to stand, 125% feels uncomfortably crowded. In rail vehicle B, with a lower seat count and large areas where passengers can comfortably stand, 125% of seated capacity feels just fine. A better metric of the true capacity of a rail vehicle is the number of seats plus some number of standees per unit of usable floor area (typically 4 standees per square meter); with such a metric, "100% capacity" feels like the same crowding regardless of train design. Load factors over 100% seated capacity are desirable. While this may be news to the person crushed between two sweaty people in the vestibule of a rush hour train, sizing the train fleet so that everyone can get a seat during the peak leads to a lot of empty seats running around the system or idling in yards during off-peak hours. This can be mitigated by changing the length of train consists (like BART), but unless trains are designed for this to begin with, it can't be done in daily practice. 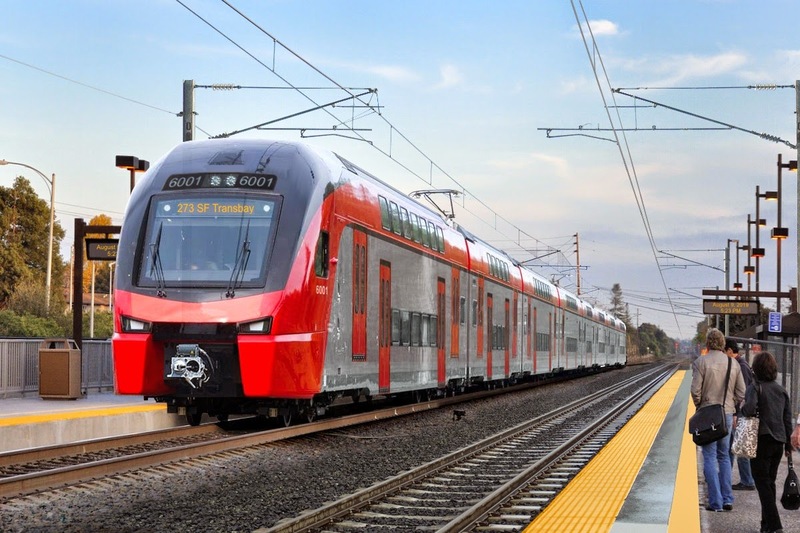 Caltrain's new fleet of EMUs will not be easily reconfigurable unless two EMUs are coupled together; plans for this are not evident in the train configurations discussed in the EMU Request for Proposals (6 cars and 8 cars). With fixed train consists, there is necessarily a sweet spot where a balance is achieved between two undesirable conditions: too many bums and not enough seats during the peak, and too many seats and not enough bums off-peak. That sweet spot will mean peak load factors should very well be over 100% when measured as a fraction of seating capacity. Middle seats are seats, too. The idea of 3+2 seating (five abreast) is usually batted away with a summary argument that passengers don't like middle seats, but it undeniably results in more seating capacity. The question is, do passengers dislike middle seats more than they dislike standing? Commuter railroads on the East Coast seem to know the answer: the Long Island Rail Road M-7, the Metro North M-8, and the SEPTA Silverliner V, (to cite only the most modern examples) all feature 3+2 seating areas. If providing seated capacity is so important, and if load factors are going to be measured as a percentage of seated capacity, then that middle seat is worth an easy 25% additional capacity. The Caltrain EMU contract could be changed to require 3+2 seating; Stadler has already built a 3+2 bi-level EMU for a Russian client. Fewer seats can actually increase passenger capacity. If Caltrain stays with 2+2 seating and a lower seat count, the additional space for standees can provide greater passenger capacity if standees are properly accommodated. The new EMUs should be configured with poles, handrails, grab handles or straps as necessary to allow standees to travel comfortably when no seats are available. During the platform height transition period when Caltrain will be operating dual boarding heights (two sets of doors), the number of seats will temporarily drop after seats are removed from the high door boarding vestibules. This may increase the load factor when measured as a percentage of seated capacity, but it will actually increase passenger capacity by opening up more room for standees. Comfort may suffer, but only temporarily. Caltrain should find a way to buy 8 car trains right away. If some trains are already running at 125% seated capacity in 2016 during the winter low season, they are probably running at 150% seated capacity during the summer. Seasonal load factor will go even higher if ridership continues to increase between now and 2020 when the new EMUs arrive. By then, even with the entire Caltrain diesel fleet at six cars per train, the system will likely be bursting at the seams. The step change in service quality thanks to the new EMU fleet will trigger another ridership increase. Taking into consideration those three factors (high season peak, continued ridership escalation and better EMU service), it seems likely that six-car EMUs will be overcrowded from day one. If Caltrain can scrape together another ~$150 million (another 7% of the total tab for modernization) to exercise an option on the Stadler contract, all EMUs can enter service in 2020 as 8-car trains. Short platforms can be dealt with by prohibiting boarding and alighting from the front or rear cars at the few stations that cannot berth a 200-meter train. An eight-car Stadler KISS with 2+2 seating will accommodate about 750 seated passengers and another 1000 standees.